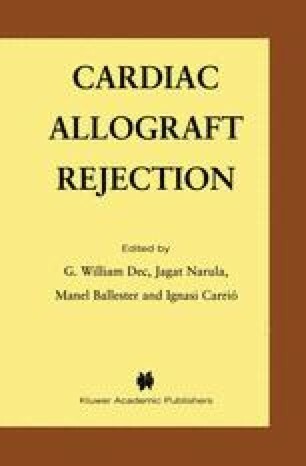 The major complication following cardiac transplantation remains acute and chronic allograft rejection. Rejection is mediated both by cells and antibody, the different components of the immune response predominating at different times. It is interesting to note that, in the early days of human cardiac transplantation, detection of antibodies was considered to be the most obvious way to monitor the recipient’s immune response. In a report published during that time,1 it was found using an indirect immunofluorescent staining technique in a study of 5 patients surviving for more than 7 days after cardiac transplantation that serum samples from these patients contained antibodies directed against components of cardiac myofibres. These antibodies were detected early (4 or 5 days) after transplantation and their presence appeared to correlate with clinical signs of rejection.